The NEW 2-step process is easy and simple with no mixing required. 1 Color Gel 15ml tube is sufficient for 30 applications 1 Developer Gel 60ml tube is sufficient for use with 4 tubes of Refectocil Sensitive Tint Refectocil Sensitive Tint Remover is specially formulated for the new Refectocil Sensitive the Original Refectocil Color Cleanser (RCC) will not remove color stains from the Refectocil Sensitive. After removing the Color Gel with a dry cotton pad wait 3-5 minutes before applying the Developer Gel this allows the hair to dry completely before the application of the Developer Gel resulting in a more intense color. 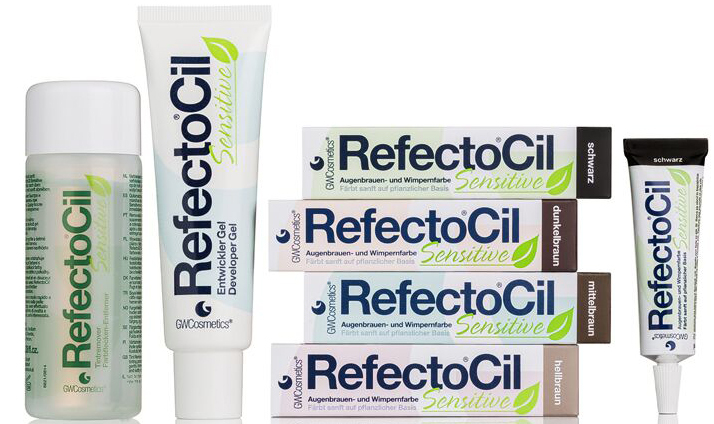 With the NEW Refectocil Sensitive you can finally offer the to ensure they have a beautiful, accentuated eyes too - day and night. The completely NEW 2-step tinting system allows you to tint eyebrows and eyelashes in only 3 minutes with colors based on plant extracts. Lasts up to 6 weeks and is smudge and waterproof. Refectocil Sensitive is the first eyelash tint that works based on plant extracts, with yarrow, horse chestnut extract, marigold, green tea, safflower, hydrangea, Chinese Galle, St John’s wort, walnut extract, juniper, goldenrod, nettle, blueberry, chaste berry, red wine extract. Dermatologically and opthalmologically tested. Available in 4 colors: Black, Dark Brown, Medium Brown & Light Brown. 1. Attach Refectocil Silicone Eye Pads or Refectocil Eye Protection Papers with Refectocil Skin Protection Cream, apply cream to skin around the brow. 3. Remove Color Gel with cotton bud. 5. Remove with a moist cotton ball. Lashes and brows must be oil free before tinting. Use Refectocil non oily Eye Make Up Remover, even if the client wears no makeup. Make sure lashes and brows are dry before tinting. Always remove the Color Gel & Developer Gel with a dry cotton pad - NOT WET! Before applying Developer Gel, make sure that the Color Gel is totally removed with a dry cotton pad - any residue could affect the tinting process. When applying the Developer Gel, always make sure that the color of the gel is clear when applied to the lashes and brows. As this is a different process DO NOT mix the Color Gel & Developer Gel together this WILL NOT tint the eyelashes and eyebrows.